Feeling spontaneous? We have space available in our upcoming Weave for the Swedish Kitchen class, May 22-25. 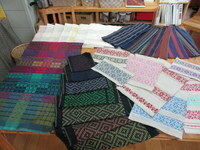 Choose your warp colors to match your own kitchen and weave an array of wonderful projects. 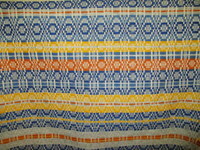 Weave fabric for an apron, with woven bands and pockets, if desired, and spend part of the week sewing it with assistance from our own Sara Jeanne Burke. Or weave rep placemats or a table square, napkins, runners and/or towels, all coordinating and loads of fun in your own colors. Call us to register and we will send you a fun program to help you in your color planning. There is one day available in our One Day Wonders session on Friday, May 18th. For those of you who have never attended Vävstuga Basics, or would just enjoy a day weaving a beautiful cottolin and tow linen towel, the One Day Wonders session is a great opportunity to experience Vävstuga surrounded by other inspirational weavers. Looking further ahead, there is one opening left in the Vävstuga Favorites class during the week of August 14-17 (and more space available in December). Whether you are a Basics Alum or have yet to experience Vävstuga, there is a wonderful Favorites project for you. Choose your own warp colors or the colors used in the project picture. See the class page for the amazing variety of projects that our students have described as their “favorites” through the years and weave one this August. 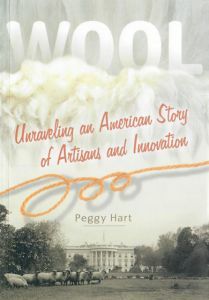 In this beautiful book, our dear friend and neighbor Peggy Hart tells wool’s colorful and surprisingly epic tale. She shows how it has impacted millions of lives–from immigrants, slaves, and Native Americans to farmers and advertisers. This is a story of technological and social change, marketing forces, and our choices as consumers. Wool is a must-read for anyone who has knitted (or worn!) socks, woven a piece of cloth, or curled up with a warm wool blanket. 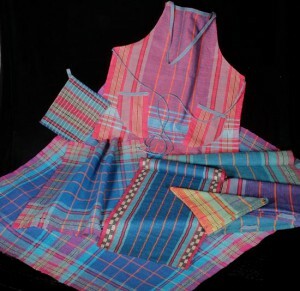 Peggy is a textile designer, production weaver, and teacher with experience in designing, producing, and marketing hundreds of blankets annually including custom blankets for sheep and alpaca farmers using their own yarn. 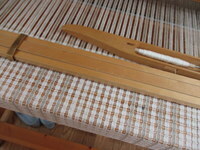 She weaves on 1940s vintage dobby looms, with widths ranging from 48″ to 92″. We so enjoyed the students in our first Drawloom ABC class, our Vävstuga Favorites class and two Nordic Classics classes this month! Projects included colorful (and long!) Rep runners and a beautiful Smålandsväv runner in the Favorites class, Single Unit, Shaft Drawloom, and Opphämta projects in Drawloom ABC, and a variety of challenging projects in Nordic Classics, including treadled Opphämta, treadled Leno Lace, Enkel Skillbragd, Halvdräll, a figured fabric from Denmark and Gagnefkrus, or Honeycomb, from Sweden. 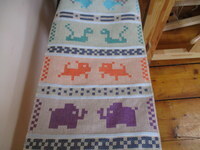 Here are some pictures of a few of the projects from these talented weavers! 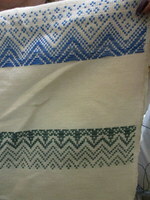 Becky also enjoyed weaving on the Single Unit/Shaft Draw Combination last month. She created this project including birds, creatures, borders and motifs using multiple patterns from the various Little White Books, Korsstygnsbolaget, by Britta Johanson. Here is a video link so you can watch 14 short videos showing the patterns included in these wonderful little books. 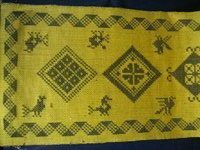 The patterns can be used for any artistic endeavor based on graphed designs such as embroidery, tiling and, of course, weaving. We’ll be offering our spring yarn sale at the end of May. Stay tuned for details in our May Newsletter!